The big thing with using a battery for ballast is to make sure the darn thing doesn't shift on you. If you decide to wire a car battery to your bike, don't forget to take the moto battery out of the charging loop! The trunk in the Cozy is much smaller than the Ural at only 3 cubic feet but I'm not sure I'd want to use it for a battery. Even the smallest car battery would still use up a lot of space. The tub is suspended from the frame so I would need to fabricate some sort of mount on the frame which doesn't touch the tub. Kind of hard to suggest something without actually seeing the tub....I personally would hate to lose the lockable storage space of the Cozy's trunk with a battery in there. The anemic alternator can be replaced with more modern alternatives that actually put out better amperage as you know, it's just money at that point. Whatever you do, don't affix the battery onto an ammo can, then mount the can on something not as solid as you thought it might be....I found out the hard way that oscillation/vibration will break metal mounts. Then again, it was russian steel so perhaps the Cozy has better metallurgy in its crafting. I've been told by many that the Cozy is on the light side so running some ballast is recommended. If I'm going to carry weight, I'd rather have it at least a little functional. The frame is accessible all the way around and I was debating welding a mount on the frame between the fender and the tub just behind the axle. I think that there is room for one of the smaller car batteries there. Bird shot in PVC tubes are probably my solution for now. I don't know if the steel in India is any better than what's used in Russia. Re the proposed mount point, yep, that might work. The tub is steel or fiberglass? Either way, consider perhaps a spare 2.5gal gas can, mounted on the tub's right rear quarter, properly reinforced, it's weight that's functional. The tub is steel and according to the specs, the whole rig is ~200 lbs. This is well over 1/3 of the weight of the bike so it seems about the right. I did pick up a 1 1/2 gallon plastic gas can but haven't quite figured out where to mount it. It is the same one that you have, I believe. Right-rear is the same area that I was thinking of for the battery. The weight ratio seems right, have you found the car comes up pretty easy on the tight right-handers? I have the Kolpin plastic gas can, holds about 1.5 gallons and I mounted it here. So far, it's caused no issues in terms of mounts or shifting. I am debating getting a second one for the other side of the tub. 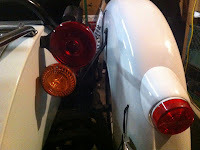 In order to get the sidecar to lift while I was practicing, I had to remove the ballast from the sidecar and even then it was a balance between turning fast enough and sliding on the snow. I figure I'll need a lot more practice once things dry out. I had ordered the Koplin Jr. as well as it was free shipping from Amazon. The RotopaX was over double the cost when you factored in shipping. The portable heart monitor was for your hack, right? I feel fine, thank you. I think the only concern is because I'm type 2 diabetic. Nice signal light ... and hoping the heart monitor says your battery is just fine! 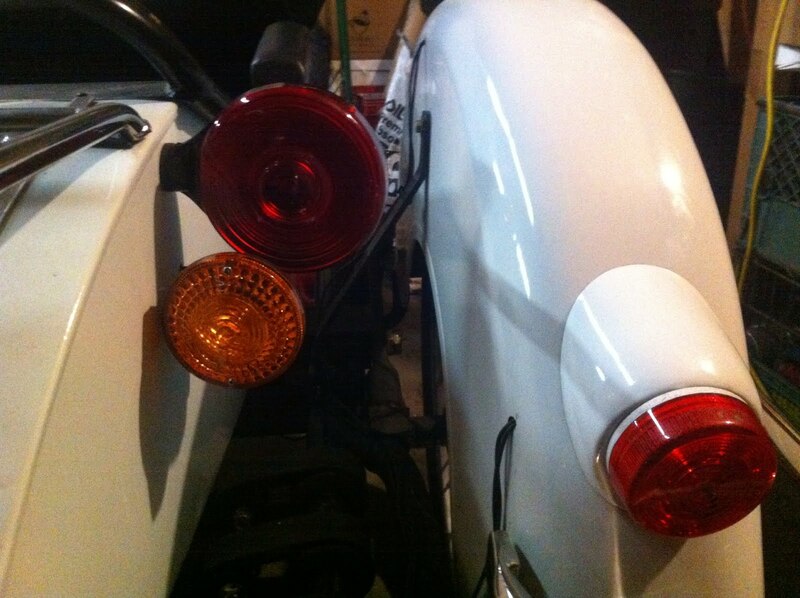 It was harder than I thought to find a suitable rear turn signal. I like the LED lights but all the ones I've seen wouldn't work. Home and already gone to Barrow - you sir get around. I'm with Sonja and Karen - hope the monitor is just routine and you are fit as a fiddle. Of course with all the walking you do I am sure you are. Barrow is well into the negative double digits and I hear, windy. Hopefully it'll improve as the week wears on. Iowa City, Barrow.... Where is Paris, London, Rome, etc. in this list? I'll join my voice to the chorus hoping you are correct that the monitoring thing is simply a crossing the "T's" sort of thing. It certainly seems you get a lot done.